The CARE 5k/10K walk run began in 1995 and h as become a yearly favorite since. Sign Up & Register Online for 2019’s Race > Click HERE! The route is an out and back on Randysek Rd starting in downtown Cable. About half of our participants are 5K walkers and the rest do the 5K or 10K Run. Beverages and snacks are provided after the race. 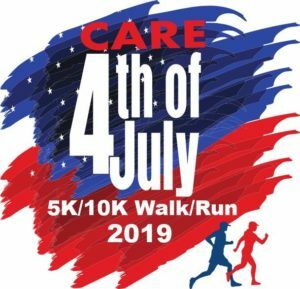 There is also a red, white & blue pancake breakfast, the 4th of July parade and a cookout and activities at the Cable Town Park following the CARE race – we encourage everyone to stay and enjoy the festivities! Runners are eligible for age group prizes, which are C.A.R.E. dollars that may be used at any of our $250 level sponsors. Red ($500), White ($250) and Blue ($100). If you would like to become a sponsor, please contact Brenda Brueske at 715-798-4700 or visit our contact page!